This week I’m at a water conference #uncwaterandhealth at the University of North Carolina (Chapel Hill) with about 700 incredibly bright folk, all trying to work out how to manage water better. Great place to learn. Despite all the great ideas here, I am surprised about how few water professionals and researchers connect the challenge of ensuring safe water supplies with sustainable land management. This link between agriculture, soils, and water is what makes coffee such an important part of water security in the coffeelands around the world. There is no better agriculture system for watershed functions than coffee agroforestry. There is some important advocacy and research to be done to make this case for policy makers and other decision-makers. The photo above was taken by my colleague Chris Seremet, a water engineer with CRS. 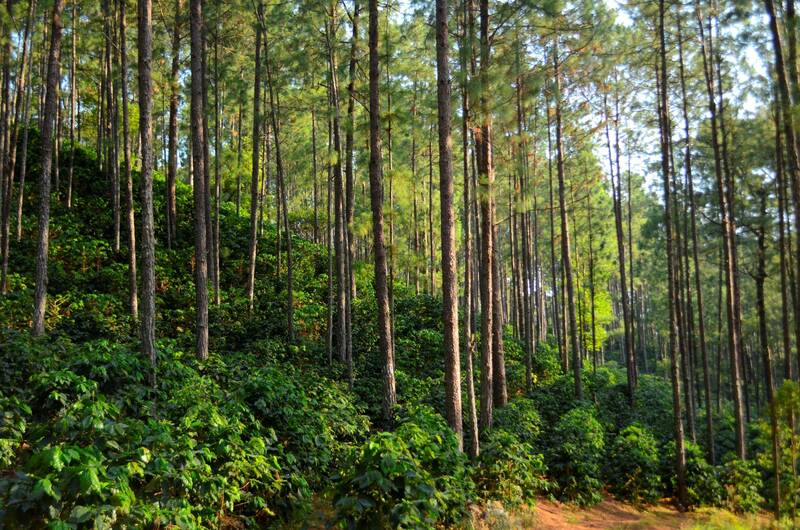 Most people (including coffee experts) are surprised to see healthy (and high quality) coffee grown under pine trees. This is in a critical watershed in southern Honduras, the water source for a town near Marcala. The trick to good coffee under these normally acidic conditions is good soil management: extra gypsum and cover crops. Very interesting research and find very usefull for me as an Agronomist working with farmers to improve the quality of their coffee. Thanks very much for your comment. I agree – there is nothing more important than soil and water for any farming system!